You'll love having this five drawer chest in your bedroom for it's natural combination of traditional and modern styles. 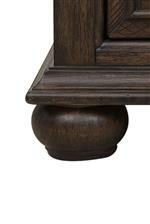 The piece is constructed of acacia veneers over hardwood solids in a highly distressed brown finish. As storage goes, you receive five spacious drawers, perfect for all of your clothing and accessories, accessed by a set of antique brass finished handle hardware to complete the transitional look. The Chatham Park 5 Drawer Chest with Elegant Bun Feet by Samuel Lawrence at Miskelly Furniture in the Jackson, Pearl, Madison, Ridgeland, Flowood Mississippi area. Product availability may vary. Contact us for the most current availability on this product.